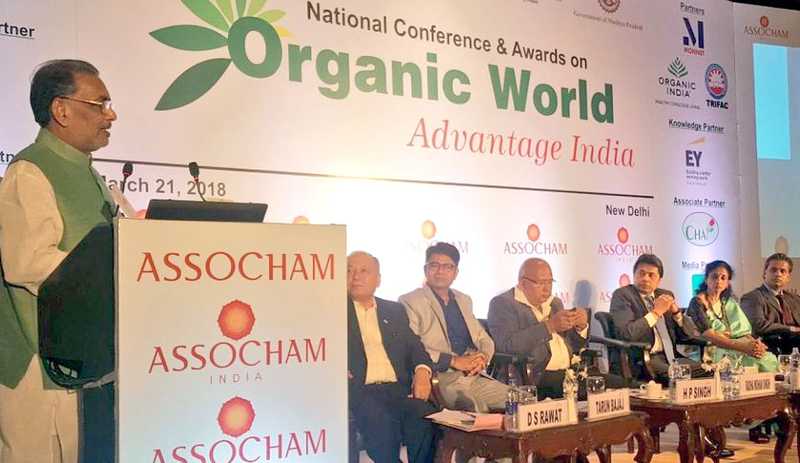 Participating in the ASSOCHAM’s National Conference on Organic farming in New Delhi on Wednesday Union Minister Radha Mohan Singh said through government’s various schemes, approximately 23 lakh hectares of land has been made suitable for organic farming. On this occasion Singh referred to Prime Minister’s dream of an India that should move towards becoming a chemical free organic country. He added that in order to promote organic farming, the government has started the Paramparagat Krishi Vikas Yojana (PKVY), under which 2 lakh hectares has been made suitable for organic farming thereby benefitting 5 lakh farmers. “Traditionally, India has been the world’s largest organic farming country and it is already being done on the basis of traditional knowledge in several parts of India. The government is committed to take India on the path of modernity in agriculture and wants to introduce new techniques”, Singh stressed. He said it is the mission of Prime Minister to ensure a successful “Organic Farming Revolution” in India on the lines of “Green Revolution” so that the farming community benefits from it. The Minister said the main objective of National Centre of Organic Farming is to promote organic farming in the country. Other government institutions like APEDA and Ministry of Commerce, while playing a leading role in improvement and control of certification system, are promoting the export of organic products. Minister also said the government has initiated the Organic Value Chain Development for North Eastern region. The aim of the Ministry is to promote organic farming in hilly and tribal areas as the use of chemical fertilizers and pesticides in these areas is very low. The Minister said the government’s target is to cover 50,000 hectares under organic farming in the North Eastern states, out of which 45,918 hectares have been made suitable for organic farming and 2429 Farmers Interest Groups have been formed, thereby connecting 48949 farmers with the scheme.